Regardless of who was really behind them and why, chances are the Boston Marathon bombings would not have happened if unconstitutional laws like AUMF 2001 and NDAA 2012 Sec 1021 were not on the books. Monday’s Boston Marathon bombing killed 3 Americans and wounded more than 170 others. It was clearly an act of terrorism, but as with 9/11 no terrorist organization has thus far claimed responsibility. That’s seen by some as an indication that the act was state-sponsored. If so, what state? I don’t know who did it. You probably don’t know who did it. And I’m convinced that the fearmongering CNN, Faux News, MSDNC and other mainstream media empty talking heads that started cackling “Al Qaeda! Al Qaeda! Al Qaeda! Homegrown Jihadists! 9/11!” before the dust even settled have no clue either. In Afghanistan, a “fierce battle between U.S.-backed Afghan forces and Taliban militants in a remote corner of eastern Afghanistan left nearly 20 people dead, including 11 Afghan children killed in an airstrike… An airstrike in the same district in Kunar that killed 10 civilians in mid-February prompted Karzai to ban his forces from requesting airstrikes (http://mil-com.me/XQKJ6B). “And along with drone attacks, an average of 4.8 children are killed per day in Afghanistan…” (http://bit.ly/YsOrym). In Iraq – where Dubya declared “Mission Accomplished” and which Odrona claims we “left with honor” – “As of midday on Monday, as security officials and medical workers continued to count the dead and wounded, at least 37 people had been killed and more than 140 wounded in nearly 20 separate attacks, mostly car bombings, in Baghdad, Kirkuk, Hilla, Falluja, Nasiriya and Tikrit, according to local officials. The local elections, the first since the withdrawal of the American military at the end of 2011, are being anticipated warily by American diplomats and United Nations officials as a crucial test of Iraq’s shaky democracy” (http://nyti.ms/159GLZ4). In Pakistan, “At least 5 persons were killed and seven others injured when a US drone struck a compound in South Waziristan Agency (SWA) here in Wana on Wednesday. According to details, an unmanned US spy plane fired two missiles at a residential compound located in village Sararogha of Babar Kot in SWA. As a result of missiles strike the compound was destroyed completely resulting in death of 5 people and leaving 7 others injured. It was feared that death toll may rise further as condition of some injured people was also stated to be critical” (http://bit.ly/YTy0zy). U.S. drone strikes in Pakistan are killing 49 innocent civilians – including children – for every 1 “known terrorist” taken out (http://bit.ly/NOthd0). Here at home, “Almost once every hour a U.S. military veteran takes his or her life. The Department of Veterans Affairs reports that 22 veterans commit suicide every day, on average. Austin veteran Andrew O’Brien almost become one of them. He survived a suicide attempt in 2010, after returning from a 12-month deployment to Iraq. Now he’s telling his story to raise awareness of post-traumatic stress disorder and military suicides” (http://bit.ly/110Kumb). For decades America’s false and failed “nationbuilding” efforts have spread death, destruction and moral decay more so than “democracy”. American drone, missile and bomb strikes are now terrorizing, maiming and killing innocent civilians and children in unprecedented numbers, and America’s military forces are losing more troops to guilt- and depression-related suicides than they are to enemy forces that the American government itself is funding. It should come as no surprise, consequently, that the insanity and inhumanity our perpetual wars for oil and profit are proliferating overseas would make their way back to our shores. Regardless of who was really behind the Boston Marathon attack – and regardless of whether their motive was payback for years of murder and mayhem or psyop propaganda to convince you to sacrifice Social Security that’s real for National Security that isn’t – one thing is certain: On Monday 15 April 2013 the citizens of Boston got a very small taste of the death and destruction America delivers daily around the world, the principal and questionable legal justification for which is the post 9/11 2001 Authorization for Use of Military Force. Pass H.R. 198 to repeal it, and we’ll all be in a safer place. AUMF Hunger Striker IronBoltBruce has fasted for 22 days, lost 31 pounds and much of his strength in hopes of raising awareness and rallying support to make that happen (http://RepealAUMF.org). Status: Weight Lost: 31lbs; Resolve Lost: None. Status: Weight Lost: 23lbs; Resolve Lost: None. Status: Weight Lost: 14lbs; Resolve Lost: None. NOTE: This release contains links shortened by bit.ly. If you wish to preview their contents before clicking them simply add a + sign to the end. For example, for bit.ly/10yJ9TN enter bit.ly/10yJ9TN+ into your web browser address bar and you’ll be sent to a preview page for the link. Please repost and forward this release. If you are charged with a crime in Amerika, you are guilty unless you are rich. 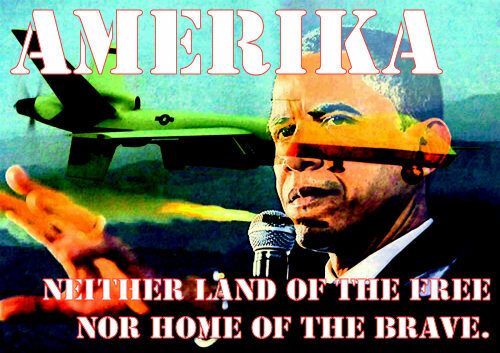 If you are struck by a drone from Amerika, you are guilty unless you survive. 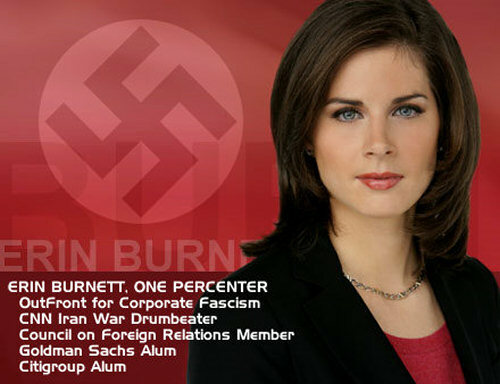 As things stand, when corporate fascist puppet president Bushbamney signs NDAA 2013 (H.R. 4310, the National Defense Authorization Act for Fiscal Year 2013), bipartisan-sponsored Amendment 114 (based on H.R. 5736) will make it legal for the U.S. government to use Nazi Germany Goebbels-style “Big Lie” propaganda on its own citizens. And no doubt one of the biggest lies our ruling elite’s Demopublican operatives will continue selling us is that America is “the land of the free and the home of the brave”. That may have been somewhat accurate at some point in in our checkered past, but it’s certainly not true in today’s post-NDAA 2012 (Public Law 112-81) Fourth Reich “Amerika”. How can Amerika be the land of the free when we have more laws on the books – and more people in prison for allegedly breaking them – than any other nation in the world? “So which country has the most laws regulating its citizenry? After looking high and low I discovered that the country with the most laws – not just today, but in all of history is… the United States. We not only have the most laws in all of history, but we also turn out more new laws and regulations to manage our people every single year than most countries turn out in decades. How can Amerika be the home of the brave when our cowardly and illegal drone attacks are killing thousands of innocent civilians – many falsely counted as “combatants”, “militants” or “terrorists” – while at the same time more of our troops commit suicide every year than get killed in action? In Pakistan (an American “ally”) alone, through mid-August last year as many as 2,956 people were killed and another 1,158 injured by U.S. drone attacks. Many were labelled “militants”, but the death toll includes at least 175 children and as many as 781 verified civilians. Despite all this collateral damage, no more than 150 “named militants” were killed. And again, these statistics are for Pakistan alone. How many more innocent children, women and men have Bushbamney’s immoral drone strikes murdered in Afghanistan, the Middle East, Africa and elsewhere? NO MORE LEFT. NO MORE RIGHT. TIME TO UNITE. STAND AND FIGHT! This document contains links shortened using http://tinyurl.com to facilitate emailing. If you are concerned that we would use them to cloak phishing or malware, you should open them with this: http://longurl.org. Also our thanks to the web design miami, web designer miami and web developer miami who support our efforts. America’s two-party tyranny has authorized endless wars, warrantless surveillance, homeland drones and indefinite detention. Now they’re legalizing the Big Lie. Our only solution is to take to the streets and quickly – before the drones overhead control our every move, and the droning of TVs and flickering of monitors our every thought. This document may contain links shortened using http://tinyurl.com to facilitate emailing. If you are concerned we might use them to cloak phishing or malware, we recommend you open them with this: http://longurl.org. Also our thanks to the website designs miami beach, website designers miami beach and website developers miami beach that support our efforts.